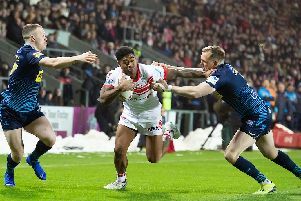 St Helens winger Tommy Makinson has admitted he is sometimes blown away by the skills of Australian team-mate Ben Barba, who has taken Super League by storm in 2018. Barba, whose superlative attacking play has helped Saints set a hot pace at the top of the league, will showcase his talent in the north east on Saturday on the opening day of the Dacia Magic Weekend. The former Cronulla, Brisbane and Canterbury Bulldogs full-back, a firm favourite to be crowned Man of Steel in his first full season in England, has drawn admirers from across the sport and they include his own team-mates. “A lot of people have been asking what it’s like to play with him and it’s fantastic,” said Makinson. “He’s especially helped the back three massively and we can only thank him for that. “People see what he’s like on the field but off the field he’s helped our game endlessly. If anyone wants advice, he’s always there to give it, he’s a great lad. “And he’s pretty special on the field as well. He blows you away sometimes. You see some of the things he does and it does take you aback, you’re behind him thinking, ‘I’m glad I’m not playing against this guy’. Barba scored a hat-trick of tries in Saints’ 36-18 Challenge Cup win at Castleford last Saturday and created others for threequarters Regan Grace and Ryan Morgan. Playing alongside the mercurial Barba has helped Makinson find the best form of his career and he is hoping that pays off with a call-up for England’s mid-season Test against New Zealand in Denver. “I’d be lying if I said I wasn’t,” said Makinson, 26, who is one of three uncapped players in England coach Wayne Bennett’s elite training squad. “I feel I’m in the best shape I’ve ever been in, this is the fastest I’ve been for a while and the time is right for me, I just feel I’m in a good team and playing my best rugby. “If that England shout comes, I’ll take it with both hands. “But if you look around the league, there’s so many good centres, wingers, full-backs nowadays.